If you are thinking that you want to buy a juicer, you need to know that not all juicers are created equal. Unfortunately, some companies make claims that are simply not true or are misleading. On the other hand, there are some juicers that are extraordinary and get the job of juicing done well. Because buying a juicer is an investment in your health, it is important to take time to do some research and ask questions before you make your purchase. 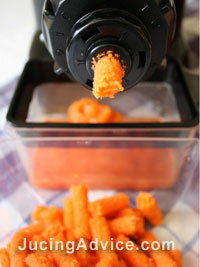 One big drawback for many juicers is how incredibly hard they can be to clean up. When you are doing something for your health, you want to make it easy enough that you will want to keep doing it. However, if cleaning your juicer is going to be a real chore, you are going to be less likely to stick with it over the long term. Find a juicer that comes apart for easy cleaning, and may even be able to go through the dishwasher as well. You want to find out how much the juicer will produce. If you find that the juicer only yields a very little bit of juice, look at an alternative machine that has a higher yield. You can look at the product specifications to see how much juice you will actually get versus the pulp it will leave behind. Although the pulp can be used for other things such as bread and muffins, you still want to get as much juice out of the machine as you can. You need to know and understand what kind of warranty you will have. Does it related to the whole machine or just the motor? Some companies offer a 10 year warranty, if they offer you a long term warranty you know they are confident about their product. Check out customer reviews online to see what other people thought who bought the same juicer. There are several types of juicers available. These include: Centrifugal juicers (Juice must be drank immediately as they create oxidation that degrade the nutrients), masticating juicers (low speed juicers, but produce higher quality juices) and hydraulic press juicers (make the highest nutrient juices because there is little oxidation). Look for juicers that are manufactured by well know, respected companies who will stand by their warranty. 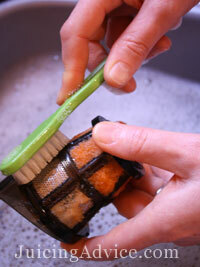 Some companies sell replacement parts for their juicers so you can easily replace parts if you break them. When you decide to buy a juicer, if you’ve spent a little time doing a bit of research you’ll stand more chance of being happy with your purchase. Don’t forget if you found other peoples juicer reviews helpful then make sure you leave your own comments about your new purchase to help guide others.